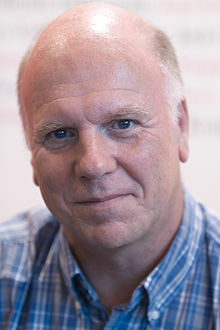 Peter Robinson (born March 17, 1950) is an English-Canadian crime writer. He is best known for his crime novels set in Yorkshire featuring Inspector Alan Banks. He has also published a number of other novels and short stories as well as some poems and two articles on writing. Robinson was awarded a BA Honours Degree in English Literature at the University of Leeds. He then emigrated to Canada in 1974 and took his MA in English and Creative Writing at the University of Windsor, with Joyce Carol Oates as his tutor, then a PhD in English at York University in Toronto. He is best known for the Inspector Banks series of novels set in the fictional Yorkshire town of Eastvale, which have been translated into nineteen languages, but also writes short stories and other novels. Robinson was born in Armley, Leeds, son of Clifford Robinson (a photographer) and Miriam Jarvis (a homemaker). Robinson emigrated to Canada to continue his studies after completing his first degree at the University of Leeds. Robinson lives in the Beaches area of Toronto with his wife, Sheila Halladay, and he occasionally teaches crime writing at the University of Toronto's School of Continuing Studies. He has taught at a number of Toronto colleges and served as Writer-in-Residence at the University of Windsor, 1992-93. Robinson and his wife live in Toronto, Canada, but they have a holiday cottage in Richmond, North Yorkshire. Set in the fictional English town of Eastvale in the Yorkshire Dales. Robinson has stated that Eastvale is modelled on Ripon and Richmond and is somewhere north of Ripon, close to the A1 road [sic]. A former member of the London Metropolitan Police, Inspector Alan Banks leaves the capital for a quieter life in the Dales. Since 2010 several of the novels have been adapted for television under the series title DCI Banks with Stephen Tompkinson in the title role. Although Caedmon's Song is a standalone novella, it is related to Friend of the Devil. ^ a b "Peter Robinson: Armley-born writer returns to roots to help budding authors". Yorkshire Post Newspapers. 16 October 2008. Archived from the original on 13 September 2015. Retrieved 15 August 2013. ^ "About Peter". Inspectorbanks.com. 21 February 2008. Retrieved 26 August 2017. ^ a b c "Peter Robinson". notablebiographies.com. notablebiographies. Archived from the original on 13 September 2015. Retrieved 24 August 2015. ^ a b "Peter Robinson". inspectorbanks.com. Peter Robinson. Archived from the original on 13 September 2015. Retrieved 24 August 2015. ^ a b c Stephenson, Hannah (11 July 2018). "Crime in the blood: creator of DCI Banks comes home". The Yorkshire Post. p. 15. ISSN 0963-1496. ^ "ITV orders six-part run of DCI Banks". Broadcastnow.co.uk. Retrieved 26 August 2017. ^ "In the Dark Places". harpercollins.com. Harper Collins". Retrieved 23 August 2015.